Shock in Chapel Hill: Should We Call It Terrorism? 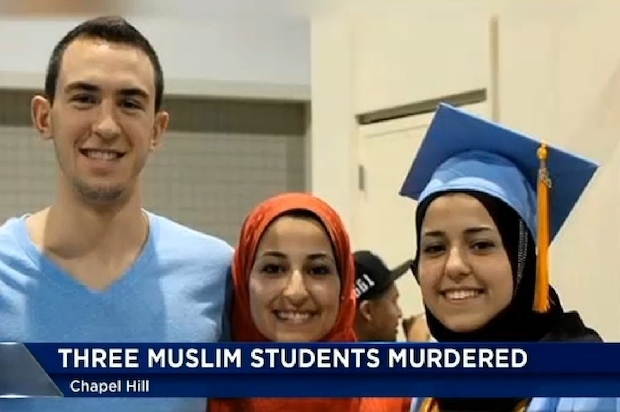 On Wednesday morning the world woke to the tragic news of the Chapel Hill, N.C., shooting of Deah Shaddy Barakat, 23; Yusor Mohammad, 21; and Razan Mohammad Abu-Salha, 19. A 46-year-old neighbor who turned himself in was subsequently arrested. As of this writing, police are saying the killings may have been related to a dispute over parking spaces, although the father of one of the victims has told reporters that the shooter had harassed them before because of their Muslim faith. My first response to this news is grief. I imagine myself in the position of the parents of the victims, and my heart aches. I can only imagine what their families are going through. (Yusor and Razan were sisters – grief compounded.) Their deaths are atrocious. That would be true no matter who they were. But somehow, their murder is all the more horrifying because the victims were young, and idealistic, and by all accounts were trying to make the world a better place. I have a concern about how this story is being told, as details unfold. Is this a case of a gun owner losing his grip on sanity, or a hate crime motivated by unknowable personal animosities? Do these killings constitute terrorism? While the answers may not matter in a pastoral sense (no matter what motivated them, the murders cannot be undone; the families’ grief cannot be removed), I think they matter in an ethical sense. And it matters because had the shooter been Muslim, surely the headlines would have been emblazoned with “terrorism.” But because the shooter was White and the victims were Muslim, this story gets reported as a “fatal shooting” or a “possible hate crime.” Those covering the crime use softer words, as though they could make the reality any less terrible, and as though they could remove our own sense of guilt for living in a society where Islamophobia may lead to senseless violence. I am White, and I know intellectually that Americans of color, particularly Muslim-Americans of color, face intolerance and hatred everyday. But I don’t want to face the fact that I live in a nation where prejudice plays such a substantial role in the lives of many of my fellow citizens. It would be comforting, in some way, to imagine that these three beautiful young people were murdered because one angry neighbor was sick. But that narrative sidesteps the realities of racism and Islamophobia with which my nation is suffused. Also circulating around Twitter was a list of bullet points which read: “Muslim shooter: entire religion guilty. Black shooter: entire race guilty. White shooter: mentally troubled lone wolf.” Remember the massacre in the Sikh Temple in Oak Creek, Wis., a few years ago? That gunman was White, and that impacted how that story was typically told. It’s an ugly pattern, and one we need to root out of our media, society, and subconscious assumptions. To be sure, American news media leap to the word “terrorism” more often than is warranted, because that word sells newspapers. But I think we owe it to Deah, Yusor, and Razan to accord them the respect we’d give if the racial and religious makeup of the parties involved were reversed. We need to tell their stories in a way that honors who they were – all of who they were. And we need to own our obligation to teach our children not to hate. Period. My religious tradition teaches that we’re all made in the divine image and likeness. All of us together make up a composite picture of divinity; there’s such an amazing breadth of human appearances – short and tall, thin and curvaceous, pale and dark!? What values do we need to teach to the next generation (and to our peers, and to ourselves) in order to hasten the day when no one could even dream of looking at another human being and wanting to extinguish the divine spark within them?